Restaurants that seek to evoke a sense of place generally go in one of two directions: a loving homage to a tender patch of land (Provence, for instance) or a city that imprints itself on the memory of even a first-time visitor (Paris, most often). One of the most anticipated debuts of this past winter, however, comes at this notion of place even more specifically. It has sought to evoke another restaurant. Housed in a 19th-century rowhouse, the Dabney hunkers in a dark, cobblestoned alley in Shaw, seducing passersby with flickering lanterns. 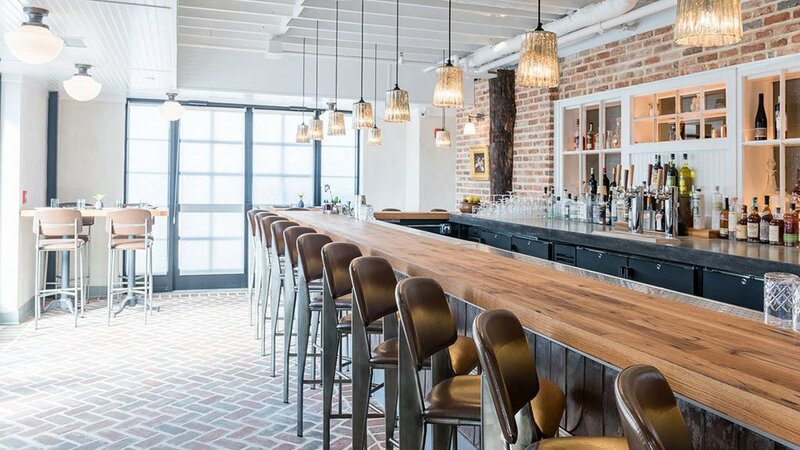 If that image calls forth a memory of Charleston’s renowned McCrady’s, then you belong to the demographic of well-traveled foodies that chef and co-owner Jeremiah Langhorne hopes to reach. 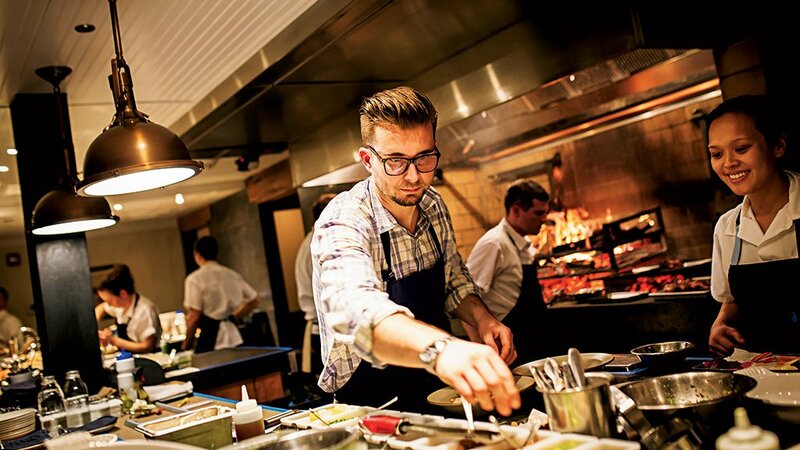 For five years, Langhorne executed the retro-forward vision of McCrady’s chef Sean Brock, who expanded the Southern larder and modernized a cuisine long associated with gooey, caloric comfort food. McCrady’s wasn’t simply a delicious night out; in a single meal, you could see both where Southern food had been and where it was going. In a phone interview, Langhorne spoke about the “blessing and curse” of having worked for such a pioneering figure. The “blessing”: premium exposure without sweating for it; witness the ten-part Washington Post series about the Dabney that started more than a year before it even opened. As for the “curse,” that’s less clear, but you can see what the literary critic Harold Bloom termed “anxiety of influence” play out in the menu, where, having deliberately baited diners with the promise of a McCrady’s north, Langhorne performs a striking switch. The lineup early on included a biscuit with ham, egg, and gravy as well as a fried porgy, but—following a menu revamp after Snowzilla—both dishes have been jettisoned. 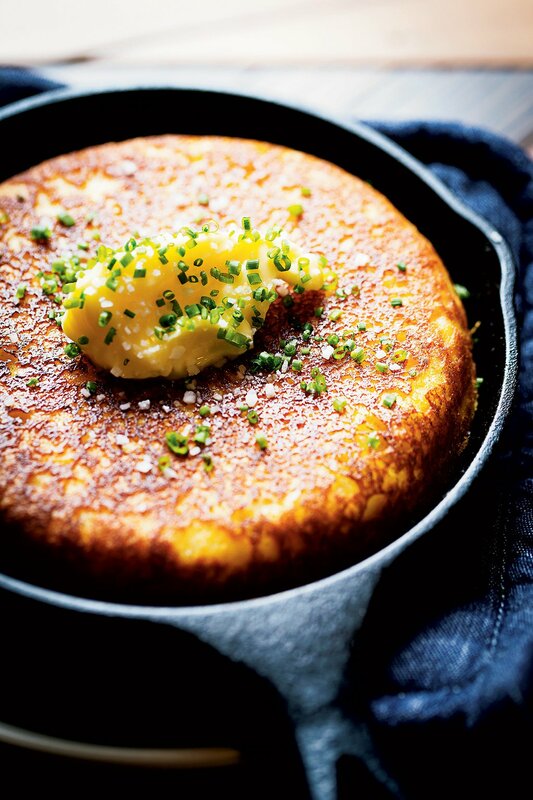 Other than a textbook cornbread, you’ll search in vain for an overt tie to either the restaurant or the city that reared him. Not only is there no shrimp ’n’ grits, but there isn’t a single dish of shrimp, period. You won’t find triggerfish, grouper, or tilefish, either, nor the rich and boggy stews that make up much of the low-country repertoire. The wettest dish here—and easily the oddest—is a plate of jerky-like strips of lamb heart doused, at the table, with what a server describes as a velouté. The lightness of its broth, however, is closer to that of a chowder, a preparation that speaks of the Chesapeake, not Charleston. It’s as if Langhorne wants both to align himself with a restaurant responsible for some of the country’s most exciting developments in food over the past ten years and to declare his independence from that tradition (and those elevated expectations). To have the security blanket and also the freedom to fling it from his shoulders. Low-country this is not; nor is it even really Southern. But Brock’s credo of returning to the ways of the preindustrial culinary past survives—it’s just been transplanted to a different terroir, in this case to the farmhouse cooking of rural 19th-century Virginia. Stumbling upon a copy of Housekeeping in Old Virginia last year, Langhorne, who grew up in Loudoun County, made two discoveries. One was just how deep his roots in the state go—the late-19th-century cookbook includes a number of recipes from his ancestors. The other was how many of those dishes were cooked in the embers of an open fire. Recognizing a sign when he saw it, the chef made a hearth the restaurant’s centerpiece. The young and well-heeled who lend the honey-lit room the air of a private club know to book one of the cozy seats that look onto it, where you’re given a glimpse of a world you might have thought survived only in historic Williamsburg. Steel arms hold cast-iron crocks and kettles at the proper distance from the heat, and cooks use fans to direct the flow of air. Other than a chicken-liver-and-foie-gras parfait—a good if undistinguished display of the kind of luxury item most fine-dining places think they have to have—every one of the chef’s 11 dishes passes through the hearth. This sounds infinitely soul-warming. The reality is that the promise of deep, slow-coaxed flavors isn’t always met on the plate. 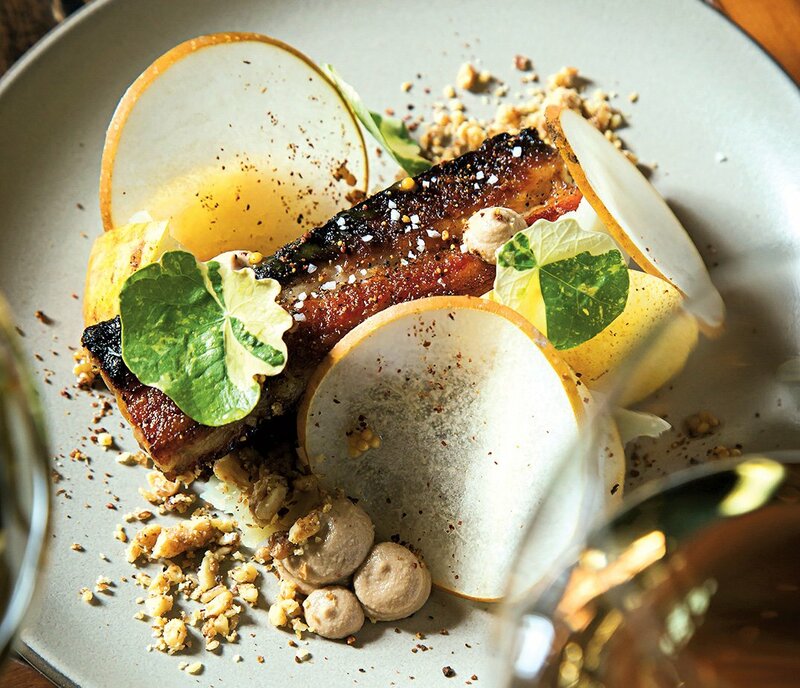 When Langhorne gets it right, however, the result is a depth of the kind that fine dining—with its elaborate conceptualizations and austere plating—can miss. 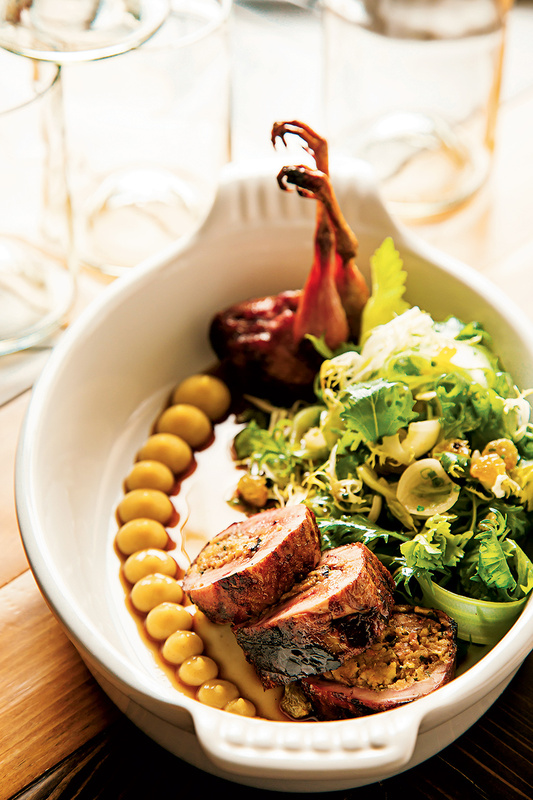 A saucy dish of “tongue of fine beans,” an obscure Virginia variety, paired with roasted pheasant, doesn’t merely conjure the past—it brings that past alive. The chef performs a similar feat of conjuring with a quail, its lacquered skin so glossy it brings to mind a mahogany antique. This elegant expression of hunt country is buttressed by oyster stuffing and pawpaw—a fruit once plentiful in Virginia—and a sublime sauce made from the bird’s juices. Vegetables are given the same treatment, with celery root baked in the embers until tender and a medley of root vegetables roasted in more direct heat. The best thing about that latter plate, though, has nothing to do with fire; it’s the way the chef pairs smoked vegetables with pickled ones, setting round flavors against sharp, warm against cool. Pickling is as important to Langhorne as his hearth—many dishes have been punched up with pickles or pickling liquids. The juiciest filet of rockfish I’ve ever tasted was crusted with benne seeds, a cousin of sesame brought over by slaves from Africa and revived by Brock; the crunchiness was memorably offset with onions softened in cider vinegar, one of 25 varieties in the pantry. The short roster of desserts is reflective of an operation that would rather not bother. Options include a blondie and an ice-cream sandwich, the latter an assemblage of chocolate-chip cookies stuffed with peanut butter and whipped cream and dusted in sumac, a spice known for shaking onto kebabs. Restaurants aren’t fixed documents; they evolve, sometimes for the better. In time, perhaps dessert will be revamped. In time, perhaps Langhorne will lose some of his need to show us his ingenuity in every last detail and will continue to refine his revivalist vision. One in which, let’s hope, soul-stirring pleasure is the aim of every plate.